SURF’S UP! | Love Productions Inc.
A Tribute to The Beach Boys, SURF’S UP! 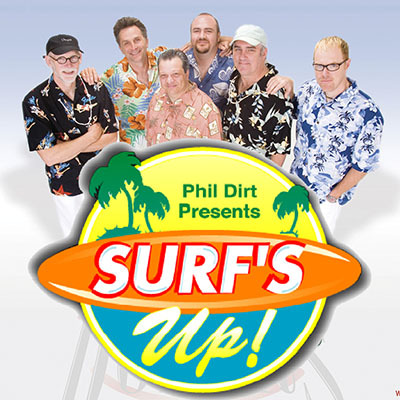 is the nation’s hottest and best beach party band created by Phil Dirt and the Dozers. With over 20 years of performing experience, Phil Dirt and the Dozers travel from coast to coast with their own sound and lighting crew. The show can be customized to fit any size audience, from 100 to 10,000. SURF’S UP! will make your next concert, party or corporate event one that your guests and audiences will never forget. Dancing and singing along to the music of The Beach Boys, Jan and Dean, The Hondells, Ronny and The Daytonas, and other beach party bands creates a fun and enjoyable atmosphere that will entertain everyone at your event.